This series started off with a bang. The 5th-seeded ’83-’84 Edmonton Oilers and the 12th-seeded ’95-’96 Colorado Avalanche entered the third period with the Oilers up 4-2. 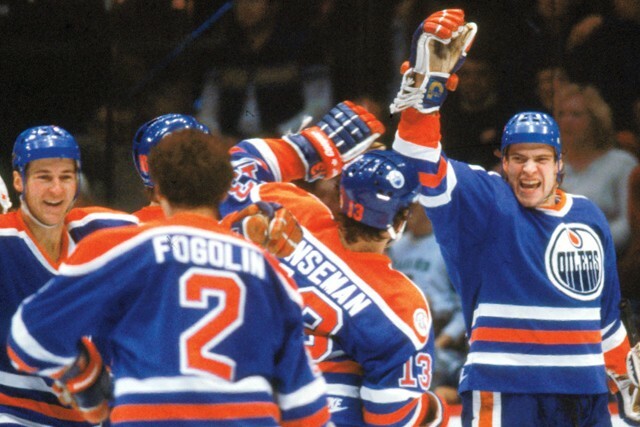 However, three goals from Colorado in the third, with a goal from Wayne Gretzky in between, saw this game heading for overtime, but a late goal from legend Jari Kurri saw the Oilers squeak out a win in Game 1. Then, in Game 2, the Avalanche held a lead in the third, but Kurri sent the game into overtime and Claude Lemieux scored the overtime game-winner to tie the series up at one. Game 3 saw both team’s explode for 12 total goals, in just the first and second period. Neither team potted a goal in the third. Edmonton led after the first period by a score of 4-3 and led after the second period by a score of 7-5, which would be the final score. In Game 4, Colorado held a 2-1 lead in the third period, but two goals from defenseman Paul Coffey gave Edmonton the win and a 3-1 series lead. In the deciding Game 5, an early power play goal from Mark Messier set the tone and the Oilers finished the series with a 5-3 win. Gretzky led the Oilers attack yet again in this round. He led them in goals with six and he added four assists for a total of ten points. Defenseman Paul Coffey broke out in a big way. The defenseman, known for his offensive abilities, did post four points in four games in the first round, but took his play to a new level against Colorado. He posted five goals and seven assists for 11 points in the five games. Messier led the Oilers in assists in the series with nine and added three goals for a total of 12 points, which was also a team high. Messier, along with defenseman Charlie Huddy, co-led Edmonton in plus/minus at +4. As this was a high-scoring series, goaltending was not very good. Edmonton goaltender, Grant Fuhr, posted decent numbers with a 3.80 goals against average and a .902 save percentage. However, Fuhr did post 40+ save performances twice, including a 45-save performance in the deciding Game 5. The Avalanche made it tough for the Oilers and Claude Lemieux is responsible for much of it. He led Colorado offensively with two goals and six assists for 8 points. Right behind him was a young Peter Forsberg who posted one goal and five assists for 6 points. Captain Joe Sakic and forward Andrei Kovalenko led the Avs in goals with three. Lemieux’s six assists led the team and he was followed by Forsberg with five and defenseman Sandis Ozolinsh with four. Sakic and forward Valeri Kamensky both were a -4 in plus/minus coming into this series, both of them posted a +4 plus/minus rating in the series, which were tops among Avalanche, to finish the tournament at even. In net, legendary goaltender Patrick Roy, struggled against the Oilers offense. He posted a .860 save percentage to go along with his 4.20 goals against average. He finished the tournament with a 3.50 goals against average and a .893 save percentage. The 5th-seeded ’83-’84 Edmonton Oilers now advance to the Quarterfinal where they will play the 4th-seeded ’73-’74 Boston Bruins, who swept the 20th-seeded ’02-’03 Dallas Stars in the 3rd Round. That wraps up the 3rd Round and it is now onto the Quarterfinal! But before that starts, there will be a recap post to go along with a stat leaders post as usual. Posts on the Quarterfinals should begin by the middle of next week! This entry was posted in 3rd Round, Ultimate NHL Playoff and tagged 3rd Round, Andrei Kovalenko, Charlie Huddy, Claude Lemieux, Colorado Avala, Edmonton Oilers, Grant Fuhr, Jari Kurri, Joe Sakic, Mark Messier, Patrick Roy, Paul Coffey, Peter Forsberg, Sandis Ozolinsh, Ultimate NHL Playoff, Valeri Kamensky, Wayne Gretzky. Bookmark the permalink.